Zhang Peng Peng (Zhang Tian Ai) dons a man's attire and is shocked when the madame sees right through her disguise, poking fun at the common perception that people in the olden days cannot tell the difference between a man and a woman. Nevertheless, her silver taels are ticket enough to gain entry to the brothel and Zhang Peng Peng has the time of her life. I was cracking up at the scene where Qi Sheng (Sheng Yi Lun) comes home with arms wide open. Looks like he's asking for a hug if you ask me so a like-minded Zhang Peng Peng assumes the same and decides to give him a man-to-man hug since it wouldn't be right to leave Qi Sheng hanging. Of course, a hug is too scandalous back in those days and she just committed the biggest social blunder. As it turns out, what Qi Sheng meant was that he needed a change of clothes. 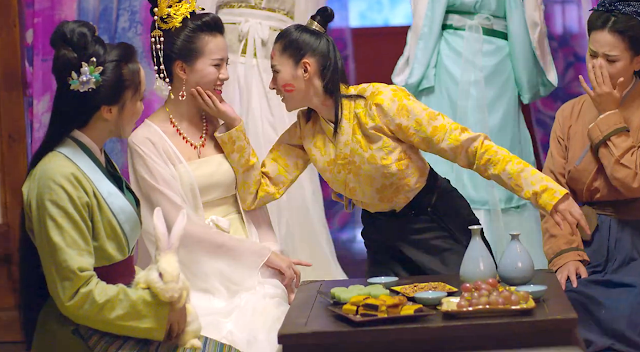 Back in the palace, crown prince Qi Sheng plays nice to Zhang Peng Peng in front of the Queen going as far as to engage in a drinking showdown with the 9th Prince (Yu Meng Long). He belatedly admits to his mistress Jiang Yingyue that his actions weren't because of Zhang Peng Peng but rather an excuse to put 9th Prince in his place. Ugh men and their male ego but surely, a man must have sufficient confidence to pull off that ridiculous outfit while attempting to look cool, and those shorts.. wow. Zhang Peng Peng accidentally catches Qi Sheng and Jiang Yingyue's illicit affair in action when she runs into Yang Yan, 9th Prince's friend. As if watching a movie, the two hide behind the bushes silently cheering for the lovers until a careless Yang Yan gives away their location. An indignant Qi Sheng punishes Zhang Peng Peng by putting her on a vegetarian diet and placing her under house arrest. Hungry and angry, Zhang Peng Peng lets out her frustrations on a helpless Yang Yan. It is time for the married couple to pay a visit to Zhang Peng Peng's home so Qi Sheng comes to prep Peng Peng. As expected, she is completely clueless and unable to recognize her own parents' pictures so she finally comes clean with the truth. 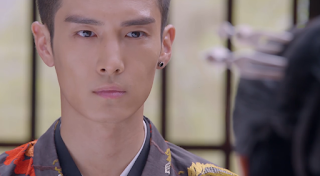 As far as time-travel dramas go, his reaction is the calmest one yet having observed for some time that Zhang Peng Peng really has changed. He half-believes in Zhang Peng Peng's time-travel story and decides to give her actual lessons before they visit her home.